Josh Brolin is going to be tough to miss for comic book fans over the next few months, and why in the world would we want to, anyway? He'll be taking on two very different roles, one as the all-powerful villain Thanos in Marvel's Avengers: Infinity War, and later as the futuristic warrior Cable in Deadpool 2. 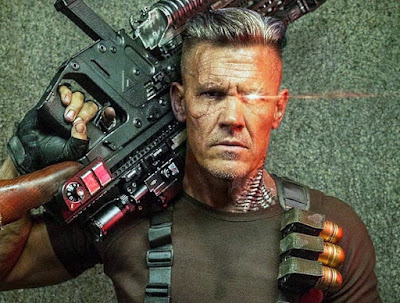 In regards to the latter role, which we know will probably expand to an X-Force movie, Brolin revealed to Collider that he nearly passed on it. But he ended up digging it so much that he's agreed to stick around for the long haul, and now we know exactly how long. "At first I was like, ‘I don’t know. I want to do George and Tammy.’ My wife — thank god — said to just read it. ‘Why are you even talking, just read it'..."I was thinking big about the four-picture deal. So, on my phone I remember I read it. It was so irreverent and funny and hysterical that once I got through it I was like, ‘that’s it.’ I had no idea [about] the fan-base. I had no idea what it represented, and I think we’ve made something really special." You didn't know there was an X-Men fanbase? Uh yeah, that's why they've been around for about 50 years. Anyway, as long as Deadpool 2 is a hit when it opens next June we should be seeing Brolin in the X-Men universe for a while. He can be seen next in this weekend's true survival drama, Only the Brave.